Let’s get to know Saudi Arabia! 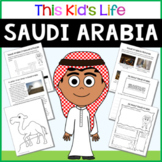 This worksheet includes 14 pages with a great variety of activities and exercises about Saudi Arabia. 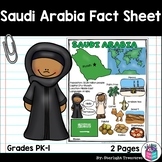 The materials have informative exercises about the things that Saudi Arabia is famous for, such as Islam, Oil Reserves, Mecca, Women’s Rights and many other things! Also included in: Adventure Math -- ALGEBRA CURRICULUM BUNDLE -- 42+ Worksheets! This Keynote presentation is a brief overview of Saudi Arabia including its: Religion, Economic System, Political System, Culture, and Facts about the country. Images are included. 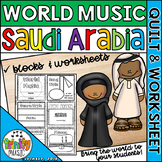 Want or need a unique, creative, and colorful resource for your lessons or unit on world music? 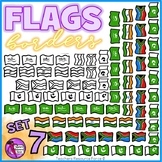 These quilt design worksheets will make a great additional resource for you and your class. Students create their own individual quilt or work as a group to complete a larger quilt (to hang on your wall). 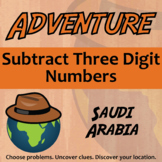 Also included in: Adventure Math -- ELEMENTARY CURRICULUM BUNDLE -- 56+ Activities! 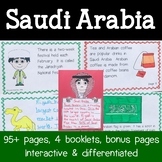 Students will read about oil in Saudi Arabia and practice answering questions about the meaning of words. This activity meets Common Core standard RI.8.4. I have used this activity as a pre and post assessment, while teaching context clues.